Many of our customers know that our passion is raising livestock on pasture in a way that regenerates the land. Witnessing animals execute what they are meant to do, which is roam our pastures, leaving it richer and more suitable than it was, is something that’s deeply rooted in the history of our farm. In the 1990’s, my Dad, Will Harris, learned that there are passionate customers who care about the same things he does: the land and the animals. After years of research, Dad was convinced he had to build a processing abattoir for our livestock and create a brand. White Oak Pastures previous green foil packaging and Harris family brand logo. If you’ve ever been to White Oak Pastures, you might notice that the older half of the farm’s buildings and signs are khaki and green. During construction, these colors were probably picked because they are two of my Dad’s favorites. If you’ve ever met him, you know that he has one “look,” which consists of Wrangler jeans and a khaki button-down short-sleeve shirt. Those are his weekday, weekend, wedding, and funeral clothes. The White Oak Pastures’ structures mimicked his style of earthtone favorites. However, for product labels, Dad deferred to a label designer, who recommended our easy-to-identify green foil. 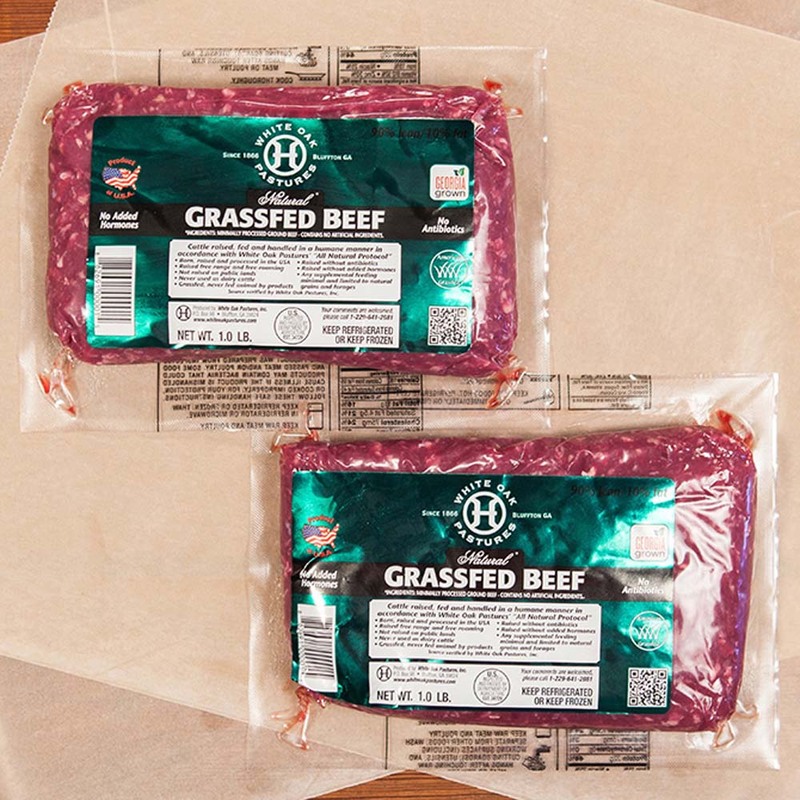 Understanding that few consumers understood what grassfed beef was in the early 2000’s, they were spot-on to lead us down the path of flashy foil and bright letters. We’ve had great success with that label and look, but almost 20 years later, we know it is time to rethink things. The landscape, which includes the soil, trees & shrubs, grasses & ground cover, along with our organic garden and fencing, has changed so much and we want our new label to reflect those changes. Not to mention the addition of 9 other species to our product offering. White Oak Pastures has evolved into one of the most diverse of all small businesses in terms of employees, enterprises, customers served, and products offered. On the journey to establishing a food system, it became less about one central concept and more about pursuing a holistic approach to cultivating the land, raising the animals, and producing wholesome products in Bluffton, Georgia. 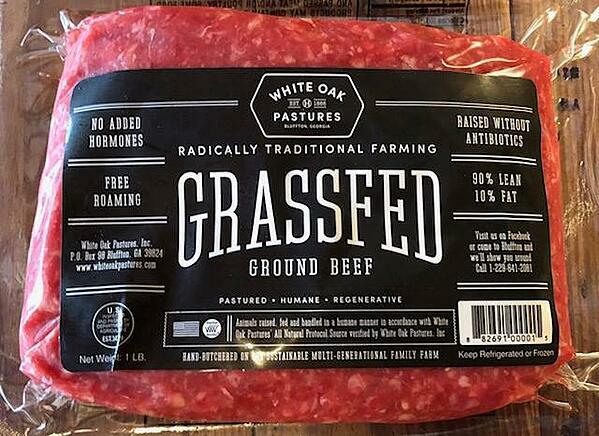 White Oak Pastures new packaging and logo for 2018. 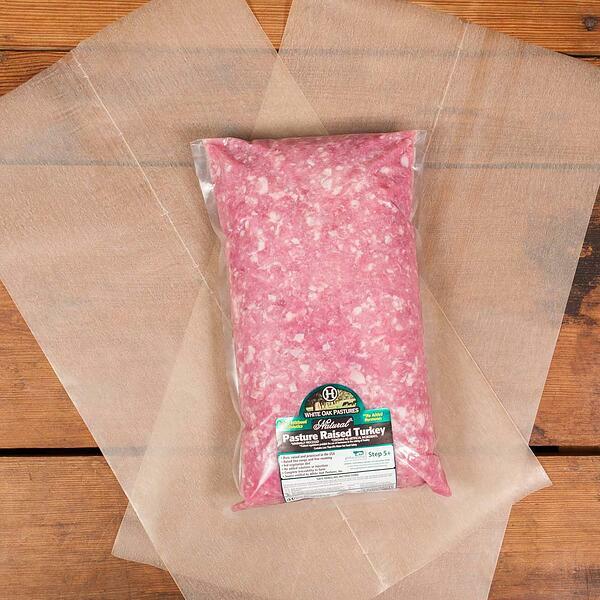 Today you’ll find our ground beef, tallow products, and leather crafts in simple black labels. There is nothing flashy about these, as they are small batch artisan products that will never be mass produced. These items were the first to transition into the new look, and we are excited to include the remaining items in this progression. You can buy them in our General Store in downtown Bluffton, GA, which is a 200-year-old building that we re-opened in 2016. We chose not to build another khaki and green tin building to act as our farm store, but to restore the authentic icon that had served past residents of this community. We invite you to visit and view the original state to which our General Store has been restored. I’m excited that our new labels and buildings mirror our evolution. We are a diverse group of passionate people doing something unique and meaningful to accomplish the goal of regenerating our land and humanely raising our livestock to enrich our community and leave a legacy for future generations.